Rebecca Lawton is a scientist and writer whose passion is communicating about nature, conservation, water, and climate. Rebecca’s pieces for general audiences have been published in Aeon, Brevity, Hakai, Hunger Mountain, More, Orion, The San Francisco Chronicle Magazine, Shenandoah, Sierra, THEMA, and many other journals. Her articles for technical publications have been in Contributions to Geology, various Proceedings, and Advances in Science and Restoration in the Bay, Delta, and Watershed. She has won a Fulbright Visiting Research Chair, the Ellen Meloy Fund Award for Desert Writers, the Waterston Desert Writing Prize, Pushcart Prize nominations in fiction, nonfiction, and poetry, and residencies at Hedgebrook Retreat for Women Writers, The Island Institute, and PLAYA Summer Lake. Rebecca was an oarswoman on the Colorado in Grand Canyon and other rivers for fourteen seasons. Her collection of essays about river life and the guiding culture, Reading Water: Lessons from the River, was a San Francisco Chronicle Bay Area bestseller in 2008 and ForeWord Nature Book of the Year finalist in 2003. For many years she directed research at a community watershed organization in northern California. She founded, acquired funding for, and oversaw a U.S. EPA-approved laboratory and program for monitoring flow and sediment on diverse streams. She has designed and managed numerous projects in stream research and citizen science, teaming with other watershed scientists, collaborating on investigations of groundwater supply and contamination, and contributing data to large technical projects. In her employment and service work, she has led or assisted strategic planning efforts, donor relations, impact assessment, and communications about conservation and climate issues. Her recent community work includes serving on the Board of Directors of Friends of the River, as an external advisor for the Science, Technology, Engineering, and Math (STEM) Program at Sonoma State University, and on the Cultural and Natural Resources Committee for Jack London State Park. Currently she is the Executive Director of PLAYA Summer Lake, a residency program for artists and scientists. Masters of Fine Arts, Writing and Literature. Mills College, Oakland, CA. 1993. Finalist, Cli-Fi Short Story Contest. Arizona State University, Tucson, AZ. 2018. Judged by Kim Stanley Robinson. Awardee, Fulbright Canada RBC Eco Leadership Program. Fulbright Canada. Ottawa, ON. 2017. Nominee, Best American Science and Nature Writing (for “Midnight at the Oasis”). 2016. Writer in Residence. PLAYA Fellowship Program for Creative Individuals, Summer Lake, OR. July 2015 and April 2017. Fulbright Visiting Research Chair in Humanities, Social Sciences, and Fine Arts. Fulbright Canada and University of Alberta, Edmonton, AB. 2014-2015. WILLA Awardee, Original Softcover Fiction (Junction, Utah). Women Writing the West, Golden, CO. 2014. Writing Resident. Hedgebrook Retreat for Women Writers, Langley, WA. 2013 and 2009. Resident Fellow. The Island Institute, Sitka, AK. 2011. Pushcart Prize Nominee for “The Road to Bonanza.” Midway Journal, http://www.midwayjournal.com/. 2011. Poetry Awardee, for “Passage,” “Where I Grew Up,” and “Burying the Barn Owl.” Twenty-first Annual Mendocino Coast Writer’s Conference, Mendocino, CA. 2010. Judged by Alison Luterman. First Place Poetry Awardee, for “Journal.” Redwood Writers Branch of California Writers Club, Santa Rosa, CA. 2009. Judged by former Sonoma County Poet Laureate Terry Ehret and incumbent Poet Laureate Mike Tuggle. Finalist, David Nathan Meyerson Fiction Prize, for “The Road to Bonanza.” Southwest Review, Southern Methodist University, Dallas, TX. 2009. Judged by Alice Hoffman. Finalist, Fiction Prize, for “The Wish.”Chautauqua. 2009. Judged by David Crouse. Ellen Meloy Desert Writer’s Award Winner, for Junction, Utah. Ellen Meloy Memorial Fund, Bluff, UT. 2006. Writing Resident (awarded but not served). Mesa Refuge, Oakland, CA. 2006. Finalist, Nature Book of the Year Award, for Reading Water: Lessons from the River. ForeWord Magazine, Traverse City, MI. 2003. Personal Essay Awardee, for “Scalping the Games.” Tiny Lights Publications, Petaluma, CA. 2001. Judged by Susan Bono. Pushcart Prize Nominee, for “Faith in the Dry Season.” Tiny Lights, Petaluma, CA. 2001. “You Are Here” Sonoma County Writing Awardee, for “Questions for the Creek.” Sebastopol Center for the Arts, Sebastopol, CA. 2000. Judged by Elizabeth Carothers Herron. Pushcart Prize Nominee, for “On Hearing about Ted.” the Acorn: a journal of the Western Sierra, El Dorado, CA. 1995. Poetry Awardee, for “Ghost of a River.” Utah Wilderness Association Review, Salt Lake City, UT. May 1993. William Warner Henry Writing Awardee, for “On the Whiteness of the Whale.” Mills College, Oakland, CA. April 1993. Steelies and Other Endangered Species: Stories on Water. Sarasota, Florida: Little Curlew Press. 2014. Junction, Utah. Encinitas, California: van Haitsma Literary. 2013. 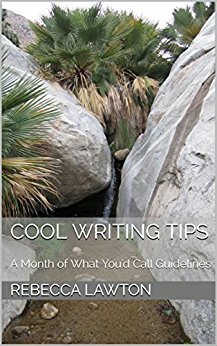 Cool Writing Tips: A Month of What You’d Call Guidelines. Vineburg, CA: Wavegirl. 2016. Sacrament: Homage to a River, with Geoff Fricker. Berkeley, CA: Heyday. 2014. Write Free: Attracting the Creative Life, with Jordan E. Rosenfeld. Glen Ellen, CA: BeijaFlor Books. 2008. On Foot in Sonoma: Twelve Walks in the Valley of the Moon, with Arthur Dawson. Glen Ellen, CA: Kulupi Press. 2004. Reading Water: Lessons from the River. Sterling, VA: Capital Books. 2002. Discover Nature in the Rocks, with Diana Lawton, Susan Panttaja, and Irene Guidici Ehret. Mechanicsburg, PA: Stackpole Books. 1997. “An Exposition of the Development of the Earth,” Slippage. http://www.slippagelitmag.co.nr/. February 2014. “Steelies,” Connotations. Sitka, Alaska: The Island Institute. 2011. “The Wish,” Perigree: Publication for the Arts. Vol. 7, Issue 3. http://www.perigee-art.com/index-3.php. April 2010. “Sipapu,” Milk & Ink: A Mosaic of Motherhood Anthology. Denver: Outskirts Press. 2010. “Only Water,” performed by Page on Stage, Santa Rosa and Rohnert Park, CA: Glaser Center and KRCB Radio 91.1 fm. 2006. “The Middle of a River in Flood,” Standing Wave. Prescott, AZ. 1997. “Sandstone,” THEMA. Metairie, LA: THEMA Literary Society. 1995. Also in Walking the Twilight II. Flagstaff, AZ: Northland Publishing. 1996. “Change of Heart,” the Acorn. El Dorado, CA: El Dorado Writers’ Guild. 1995. “What I Never Told You,” Walking the Twilight. Flagstaff, AZ: Northland Publishing. 1994. “Swimming Grand Canyon,” and “The Great Unconformity,” Going Down Grand: Poems from the Grand Canyon. Anthology edited by Peter Anderson and Rick Kempa. Fruita, Colorado: Lithic Press. 2015. “Tiny Dancer,” Sonoma Valley Sun. Print and online, http://kenscorner.sonomaportal.com/2012/08/23/tiny-dancer/. August 23, 2012. “Boatwomen,” in Still Crazy, A Literary Magazine. Worthington, Ohio. 2011. “Bastion,” Adirondack Explorer. Saranac Lake, NY: Getting the Word Out, Inc. 2011. “Passage,” “Where I Grew Up,” and “Burying the Barn Owl,” Todd Point Review. Mendocino, California: College of the Redwoods. Edited by Maureen Eppstein. 2010. “Journal,” Sonoma Valley Sun. Vol. VI, Issue 27. Sonoma, CA. October 9, 2009. “What’s So Feminine about a Mandolin?” in Traditional Music Issue of Shenandoah: The Washington and Lee University Review. Lexington, VA: Washington and Lee University. 2006. “Seen Near Loma,” Standing Wave. Prescott, AZ. 1997. “Night Noise,” Community Poetry Anthology, Festival Edition. Sonoma, CA: da Rosa Events and Readers Books. 1996. “Cougars and Mr. Redford,” Sonoma Poets Collection II. Sonoma, CA: Hilltop Publishing. 1995. “Ghost of a River,” Review. Salt Lake City, UT: Utah Wilderness Association. 1993. “Giving In.” Hunger Mountain: The VCFA Journal for the Arts. http://hungermtn.org/giving-in/. March 23, 2017. “Actor, Author Jane Alexander Turns Her Attention to Wild Things, Wild Places.” Press Democrat. Santa Rosa, California. October 20, 2016. “Why Trails Matter,” Ridge Lines. San Francisco: Bay Area Ridge Trail Council. Summer 2016. “The Big Dam Era Is Not Over,” Undark. http://undark.org/article/storage-dams-water-groundwater-canada-drought-site-c/. Cambridge, MS: Knight Science Journalism, MIT. “Sleuthing for Sonoma Valley’s Oldest Streams,” Press Democrat. Santa Rosa, California. March 23, 2016. “Boatwomen,” Sweatpants&Coffee. http://sweatpantsandcoffee.com/boatwomen/. February 19, 2016. “Chasing Waterfalls,” Press Democrat. Santa Rosa, California. February 4, 2016. “The Twelve Days of Christmas Island,” Hakai Magazine. http://www.hakaimagazine.com/article-long/12-days-christmas-island. Victoria, British Columbia, Canada: Tula Foundation. December 25, 2015. “Of Christmas Holly, Grizzly Bears, and Sudden Oak Death,” Press Democrat. Santa Rosa, California. December 24, 2015. “Zugunruhe and the Migration,” Press Democrat. Santa Rosa, California. November 11, 2015. “Midnight at the Oasis,” Aeon. http://aeon.co/magazine/science/the-high-environmental-cost-of-our-oasis-fix/. Melbourne: Aeon Media Ltd. November 6, 2015. “Consistently Lovely: The Exceptional Field Notes of Martin H. Moynihan,” Hakai Magazine. http://www.hakaimagazine.com/article-short/consistently-lovely-exceptional-field-notes-martin-h-moynihan. Victoria, British Columbia, Canada: Tula Foundation. October 23, 2015. “Skunk Highway,” Press Democrat. Santa Rosa, California. September 6, 2015. “Getting the Drift,” Hakai Magazine. http://www.hakaimagazine.com/article-short/getting-drift. August 14, 2015. “Drought and the Ostrich Syndrome,” Aeon. http://ideas.aeon.co/viewpoints/1704. April 14, 2015. “The Place Where the Records Are Kept,” Newsletter. Victoria, Canada: Friends of the BC Archives. Vol. 14, No. 5. March 2015. “Pug Boat,” Women in Nature: An Anthology. Reading, Pennsylvania: Louise Grace Publishing. May 2014. “As the Eel Curves: The Life and Writings of Zara Raab,” The Redwood Coast Review. Point Arena, CA: Friends of the Coast Community Library and Independent Coast Observer. Spring 2014. “The Other,” The East Bay Monthly. Oakland, CA: Telegraph Media. December 2013. “A River, Three Gardens, and Two Summer Pies,” Spoonwiz.com. http://www.spoonwiz.com/a-river-three-gardens-and-two-summer-pies/. September 3, 2013. “Green River Valley, Utah,” The Place Where You Live, Orion. Great Barrington, MA: The Orion Society. July/August 2013. “Tortilla Soup,” Spoonwiz.com. http://www.spoonwiz.com/tortilla-soup/. June 14, 2013. “Neck-Deep in the Colorado,” in “Learning to Love that Furnace-Like Sensation,” Ideas Up for Discussion, Zocalo Public Square. www.zocalopublicsquare.org. March 13, 2013. “Death Throes,” Mission at Tenth. San Francisco: California Institute of Integral Studies. Volume 3. Spring 2012. “Eating Stone,” review of Eating Stone: Imagination and the Loss of the Wild, by Ellen Meloy. Torrey House Press Original Book Reviews, www.torreyhouse.com. April 2011. “Take the ‘C’ Train,” Art, Literature, and Place: An Ecopoetics Reader. Toronto: Canadian Journal of Environmental Education. Volume 13 (2). 2008. Previously in A Mile in Her Boots: Women Who Work in the Wild. Palo Alto, CA: Solas House. 2006. Sonoma County Women’s Voices. Sebastopol, CA: Women’s Voices. May 2004. Also in Reading Water: Lessons from the River. Sterling, VA: Capital Books. 2002. Media Lounge Reviews of The Earth Knows My Name, a book by Patricia Klindienst, and The Fragile Edge, a book by Julia Whitty. Sierra. San Francisco: Sierra Club. May/June and July/August 2007. “Felling the Trees,” San Francisco Chronicle. San Francisco: Hearst Corporation. July 22, 2006. “The Art of Starting Over,” More. NY: Meredith Publishing. July/August 2006. “Some of My Best Friends,” Sonoma Woman insert in The Press Democrat. Santa Rosa, CA: The Press Democrat, part of The New York Times Company. September/October 2006. “The Tongue,” The Best Women’s Travel Writing, 2006: True Stories from Around the World. Lucy McCauley, editor. Palo Alto, CA: Travelers’ Tales. 2006. “Possession,” San Francisco Chronicle Magazine. San Francisco: Hearst Corporation. 2006. “American Art,” “Moon River,” and “A Reluctant Geologist Writes about Rocks,” read on Word by Word. Rohnert Park, CA: KRCB Radio 91.1 fm. 2005. “The Company of Rocks,” Orion. Great Barrington, MA: The Orion Society. November/December 2005. “In the Oasis,” Tiny Lights. Petaluma, CA: Tiny Lights Publications. 2005. “Scalping the Games,” Tiny Lights. Petaluma, CA: Tiny Lights Publications. 2003. “Book Case,” “War Zone,” and “Wingin’ It,” in “Open Mic,” Northern California Bohemian. Santa Rosa, CA: Metrosa, Inc. 2000 and 2001. “On the Colorado River,” 365 Travel. San Francisco: Travelers’ Tales. 2001. “Headwaters,” The Gift of Rivers: True Stories of Life on the Water. San Francisco: Travelers’ Tales. 2000. “Imbrication,” Word Tastings. Summerland, CA: Santa Barbara Review Publications. 1998. Excerpted in A Woman’s Passion for Travel. San Francisco: Travelers’ Tales. 1999. “Down to Earth,” “Dynamic Duo,” “Growing with Expert Systems,” “Heavy Metals,” “Out of the Woods,” additional articles. Penn State Agriculture. University Park, PA: Penn State College of Agriculture. 1988. “Fear and Loathing on the Upper Yampa,” Wasatch Sports Guide. Salt Lake City: Mills Publishing. 1984. “Early History of the Tuolumne River Canyon,” Interpretive Guide to the American, Stanislaus, and Tuolumne Rivers. Berkeley, CA: Pacific Rivers Outfitters Association. 1975. “Story as a Way In: Response to Change in Climate and Water,” in Living on the Edge of Change: Exploring the Dimensions of Restoring Fire Resilient Landscapes, Culture, and Economies on the Cascade Range’s Eastside: Proceedings of the 87th Annual Meeting of the Northwest Scientific Association. Bend, OR: Central Oregon Community College. March 23-26, 2016. “Measuring Sediment in Sonoma Mountain’s Streams” (with Laurel Collins and Arthur Dawson). Cotati, CA: Copeland Creek Watershed Symposium. 2013. “Addressing the Sediment Problem in Sonoma Creek Watershed” (with Deanne DiPietro, Laurel Collins, and Arthur Dawson). Napa, CA: Napa County Watershed Symposium. 2011.
with Caitlin Cornwall, Deanne DiPietro, Mark Newhouser, and Alex Young. In Proceedings 28th Annual Salmonid Restoration Conference and the 44th Annual American Fisheries Society Cal-Neva Conference, Fisheries Restoration and Science in a Changing Climate. www.calsalmon.org. 2009. “Estimating Sediment Production for the Sonoma Creek TMDL” (with Laurel Collins and Arthur Dawson). Oakland, CA: State of the Estuary Conference. 2007. “Measuring Sediment in Jack London’s Streams, Sonoma Creek Watershed, Sonoma County” (with Kristine Camacho). Oakland, CA: State of the Estuary Conference. 2005. “Monitoring Suspended Sediment Concentration and Turbidity, Sonoma Creek Watershed, Sonoma County” (with Jenny Tribo). Oakland, CA: State of the Estuary Conference. 2003. “Volunteer Monitoring of Suspended Sediment Concentration and Turbidity, Sonoma Creek Watershed, Sonoma County, CA” (with Rich Hunter and Jeanna Menze). Advances in Science and Restoration in the Bay, Delta, and Watershed. CALFED Science Conference. January 14-16. Sacramento, CA. 2003. “Taphonomy of the Dinosaur Quarry, Dinosaur National Monument,” Contributions to Geology, volume 15. Laramie, WY: University of Wyoming. 1977. Sonoma Valley Historical Hydrology Project, Phase I. With Arthur Dawson of Baseline Consulting and Alex Young of Sonoma Ecology Center, for Sonoma County Water Agency. 2016. Technical Memorandum, Sonoma County Integrated Groundwater Potential Recharge Model. With Bryan Sesser, Sonoma Ecology Center, for Sonoma County Agricultural Preservation and Open Space District and Sonoma County Water Agency. June 12, 2014. Final Report, 2013 Sonoma Biochar Initiative Citizen Science Project. With Raymond Baltar, Donald Osborne, and Autumn McElroy. 2013. Developing Prioritization Criteria for Reach-Scale Enhancement and Erosion/Incision Projects in Sonoma Creek Watershed. With Deanne DiPietro and Alex Young of Sonoma Ecology Center and Laurel Collins of Watershed Science. 2013. Sonoma Valley Groundwater Recharge Potential Mapping Project, Technical Report. With Deanne DiPietro and Bryan Sesser of Sonoma Ecology Center and Marcus Trotta of Sonoma County Water Agency. 2011. A Transferable Protocol to Identify and Prioritize Sites for Watershed Restoration under Clean Water Act Programs. With Deanne DiPietro and Alex Young of Sonoma Ecology Center and Laurel Collins of Watershed Science. 2010. How Are We Doing? Developing A Watershed Scorecard for the Napa River and Sonoma Creek Watersheds. With Frances Knapczyk, Caitlin Cornwall, Deanne DiPietro, Chris Farrar, Rainer Hoenicke, Frances Knapczyk, Rebecca Lawton, Lisa Micheli, Kat Ridolfi, Peter Vorster, Alex Young, Bob Zlomke. 2009. Sediment Source Analysis, Sonoma Creek Watershed, California. With Sonoma Ecology Center, U.C. Berkeley Department of Earth and Planetary Sciences, Stillwater Sciences, Tessera Consulting, Talon and Associates LLC, and Watershed Science. Prepared for San Francisco Bay Area Regional Water Quality Control Board. 2006. Stream Stewards Project, A Five-Year Report of Volunteer Monitoring. With Michelle Orme and Lisa Micheli of Sonoma Ecology Center. 2004. Volunteer Monitoring of Suspended Sediment and Turbidity, and Watershed Monitoring of Road Remediation in Annadel State Park. With Rich Hunter and Jeanna Menze of Sonoma Ecology Center. Prepared for San Francisco Bay Area Regional Water Quality Control Board. 2002. Speaker, “Your Brain on Climate Change: Story as a Way In.” Victoria Natural History Society, Victoria, B.C., and Search for Meaning Bookfest, Seattle, WA. February 14 and 25, 2017. Presenter, “In Conversation with Jane Alexander on Wild Things, Wild Places: Adventurous Tales of Wildlife and Conservation on Planet Earth.” Copperfields Books. Petaluma, CA. October 20, 2016. Presenter, “Equal Voice for the Earth: Women Writers and the Environment.” Hedgebrook Retreat Benefit at Pepperwood Preserve. Santa Rosa, CA. July 21, 2016. Speaker, “Convergence of Arts, Humanities, and Ecology in Inspiring Northwest Landscapes: A Series of Short Talks by Writers, Artists, and Scientists.” Northwest Scientific Association Meeting. Bend, OR. March 24, 2016. Presenter, “From Raw to Cooked: Water, Climate, and Creative Writing in the American West.” Women Writing the West Conference. October 8 through 11, 2015. Presenter, Author Reading, “The Sentinels.” Waterston Desert Prize, High Desert Museum. Bend, OR. June 25, 2015. External Advisor, Science, Technology, Engineering, and Math Program, Sonoma State University. 2011 to present. Instructor, Point Reyes Field Institute. Point Reyes National Seashore, CA. 2013 to 2015. Technical Advisor, Natural/Cultural Resource Committee, Jack London State Historic Park. Glen Ellen, CA. 2014. Presenter, “Sacrament,” Gateway Science Museum, College of Natural Sciences, CA State University, Chico, CA. April 2014. Presenter, “Lessons from the River,” TX Grain and Feed Association 116th Annual Meeting and Expo. April 2014. Presenter, Friends of the Sonoma Valley Library. Sonoma, CA. 2014 and 2015. Board of Directors, Friends of the River. Sacramento, CA. 2012 to 2014. Presenter, Occidental Center for the Arts. Occidental, CA. 2013. Lecturer, Watershed Series, “Sustainability in My World,” Sonoma State University. Rohnert Park, CA. 2013. Presenter, North Coast Redwoods Writer’s Conference, College of the Redwoods. Crescent City, CA. 2012 and 2013. Member, Technical Advisory Committee, Groundwater Management Plan, Sonoma County Water Agency. Sonoma, CA. 2009 to 2013. Presenter, The Island Institute. Sitka, AK. 2011. Presenter, Write Free Creativity Series. With Jordan E. Rosenfeld. Bodega Bay, CA. 2010. Presenter, Redwood Branch of California Writer’s Club. Petaluma, CA. 2010. Literary Judge, Annual Personal Essay Contest, Tiny Lights Magazine. Petaluma, CA. 2005 to 2013. Member, Technical Advisory Committee, Sonoma Ecology Center. Sonoma, CA. 1998 to 2000. Literary Judge, Annual Sonoma Valley Writing Faire. Sonoma, CA. 1998 to present. Presenter, Redwood Branch of California Writer’s Club, First Annual Conference. Santa Rosa, CA. 2009. Presenter, Literature Readings on “Control,” SOMArts Cultural Center. San Francisco. 2009. Presenter, Creativity and Education Series, Copperfield’s Books. Petaluma, CA. 2009. Presenter, Mendocino LitFest, Mendocino Community College. Ukiah, CA. 2009 and 2012. Presenter, Writer’s Sampler Series, Sebastopol Center for the Arts. Sebastopol, CA. 2005 and 2009. Literary Judge, Sense of Place Poetry Competition, Kulupi Press. Glen Ellen, CA. 2005 to 2008. Presenter, Sonoma County Book Fair. Santa Rosa, CA. 2003, 2006, and 2008. Presenter, Deep Storytelling and Nonfiction, Mendocino Coast Writers Conference. Mendocino, CA. 2007. Member, Technical Advisory Committee, Laguna de Santa Rosa. Santa Rosa, CA. 2007. Presenter, Writing with Nature. Writers Forum. Petaluma, CA. 2006. Literary Judge, Bay Area Middle School Poetry Out Loud Contest. Berkeley, CA. 2006. Facilitator, Writer’s Retreat, Wellspring Renewal Center. Philo, CA. 2002 to 2006. Presenter, Women on Writing Conference, Skyline College. San Bruno, CA. 2005. Lecturer, Self-Discipline Series, Pleasanton Public Library. Pleasanton, CA. 2004. Presenter, Science and the Environment Series, Rocky Mountain College. Billings, MT. 2003. Member, Earth Stewards Committee, Sonoma First Congregational Church. Sonoma, CA. 2002 to 2003. Presenter, Sonoma County Literary Salon. Petaluma, CA. 2002. Poet-Teacher, California Poets in the Schools. Sonoma, CA. 1996 to 2002. Literary Judge, On Water Contest, Sebastopol Center for the Arts. Sebastopol, CA. 1999. Presenter, Sonoma Writer’s Circle, Sonoma Community Center. Sonoma, CA. 1998. Leader, Poetry and Spirituality Workshops. Sonoma First Congregational Church. Sonoma, CA. 1994 to 1997. Presenter, Women in Grand Canyon, Friends of the River Conference. San Francisco. 1995. Instructor, Poetry and Spirituality Workshops. Sonoma First Congregational Church. Sonoma, CA. 1994 to 1997. Rosenfeld, Jordan. “Rebecca Lawton: The Wilderness Inside and Out.” Write Livelihood. http://jordanrosenfeld.net/6119-2/. February 29, 2016. Olsen, Erica, “Steelies and Other Endangered Species by Rebecca Lawton.” Necessary Fiction. Stephanie Naiman, “So You Want to Be a . . . River Guide.” Auntie Venom. http://auntievenom.com/so-you-want-to-be-a-river-guide/. November 2015. Boon, Sarah, “Environmental Writer Interviews.” Watershed Moments: Thoughts from the Hydrosphere. https://snowhydro1.wordpress.com/2015/06/22/environment-writer-interviews-rebecca-lawton/. June 22, 2015. Beck, Jeannie, “Scientist and Author Goes with the Flow.” Borrego Sun. Vol. 64, No. 7. March 26, 2015. Chang-Yen Phillips, Chris, “What Graphs Cannot Tell.” Terra Informa. http://terrainforma.ca/2015/02/23/what-graphs-cannot-tell/. CJSR-FM. February 23, 2015. Cumbo-Floyd, Andrea, “Stay Light about It All.” andilit.com. http://andilit.com/2015/01/24/stay-light-about-it-all-a-writers-write-interview-with-becca-lawton/. January 24, 2015. Kallen, Christian, “River Runner, Writer, Publisher Tells How It’s Done.” http://healdsblog.com/community-news/river-runner-writer-publisher-tells-how-its-done/. January 13, 2015. Necessary Fiction, “Research Notes: Steelies and Other Endangered Species.” http://necessaryfiction.com/blog/ResearchNotesSteeliesandOtherEndangeredSpecies. August 8, 2014. Little Curlew Press, “Steelies and Other Endangered Species: Stories on Water.” https://www.youtube.com/watch?v=SZsoXWwpk5A. February 12, 2014. B.R.A.G., “Author Interview: Rebecca Lawton.” http://www.bragmedallion.com/authors-chat/junction-utah-rebecca-lawton. December 13, 2013. Book Goodies, “Interview with Author—Rebecca Lawton @LawtonRebeccaC.” Interviews with Authors. http://interviewswithwriters.com/interview-with-author-rebecca-lawton/. 2013. Likowski, Jim, “Junction, Utah.” http://www.amazon.com/Rebecca-Lawton/e/B001K7UN7M/ref=dp_byline_cont_book_1. January 12, 2013. Teal, Louise, “Becca Lawton.” Breaking into the Current. Tucson, Arizona: University of Arizona Press. 1996. LaBastille, Anne, 1980. Women and Wilderness. San Francisco: Sierra Club Books. International Exchange Alumni, U.S. Department of State, Washington, D.C.